These hydration pouches were designed for those missions where you don't need or want 100oz of water on your back. They hold 40oz each, and can be mounted anywhere on a vest or pack with S.T.R.I.K.E./MOLLE. Originally designed by warfighters to mount on their sides during vehicle ops, they are adaptable to almost any hydration need. 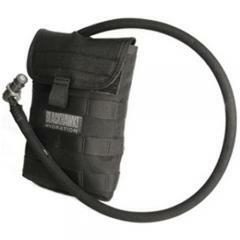 Carry more than one and use the patented quick disconnect to switch tube from one to another.